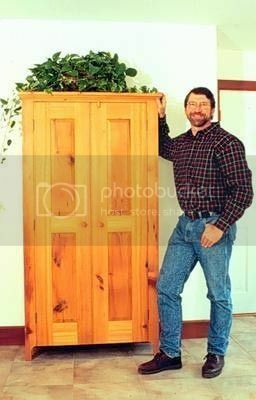 Norm asks, "Have you ever noticed that most armoires and linen presses are too big to fit in today's rooms and look just right?" However, in a private collection in Savannah, Georgia, he finds a beautiful antique linen press whose three-foot by six-foot size make it versatile enough to fit in almost any room. Featuring streamlined, raised-panel double doors with detail beading, its simple design seems almost modern. Back in The New Yankee Workshop, Norm recreates this piece out of recycled pine to give it a vintage look. The field trip was to the home of Keith & Julie Dimond, who live in Savannah, Georgia.